Select remodels and renovations are major factors in increasing the real estate value of a home. 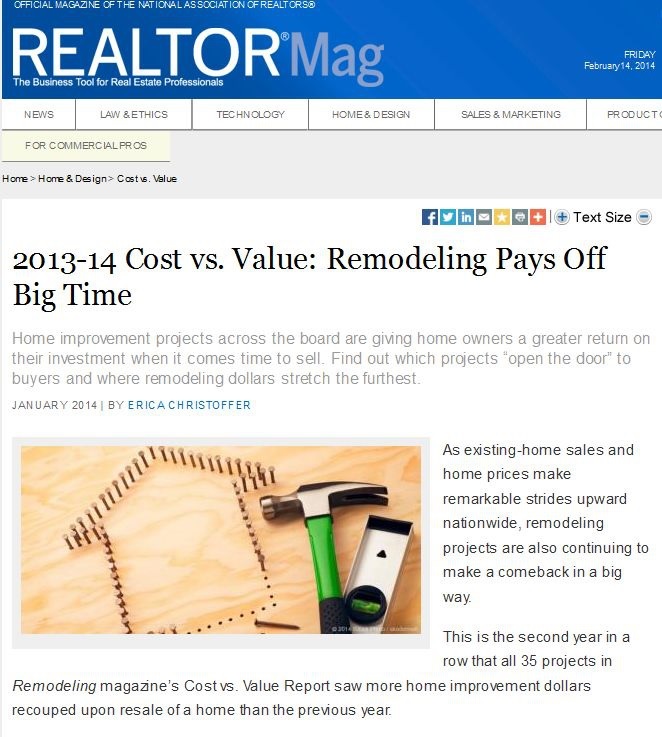 In a Realtor Mag feature, Erica Christoffer rolls out analytic data on remodel projects that add real estate value. Roofing replacement is among the listed upscale home improvements. “As existing-home sales and home prices make remarkable strides upward nationwide, remodeling projects are also continuing to make a comeback in a big way. In addition to total roof makeovers, basic repairs are among the remodeling projects one can do with the help of a roofing contractor for Menlo Park homes. Tiles or shingles that have come loose, cracked, or broken can be replaced. Rusts and corrosion in metal roofs should be cleaned or sanded off, or the affected parts should be replaced in a timely fashion. Flashing, the most vulnerable part of sturdy slate roofs, can also be replaced. Intensive fixes can be done for more serious problems. Leaks and inefficiencies in ventilation may be caused by poor insulation. The underlayment or insulating barrier of the roof may be relined in some cases. Gutters also prevent leaks by proper water drainage, so gutter repairs or upgrades add protection to the roofing system. For serious or extensive damages, re-roofing may be necessary. Ancestral homes with decades-old slate roofs may exhibit flaking on the surface or powdering underneath. Growth of moss and molds from excessive moisture happens in most roof types including clay tiles, asphalt shingles and metal. Replacements with the same roof material should be done using sturdy brands and professional installation. Investing on modest tweaks or challenging renovations are all significant in improving the real estate value of the house. These projects can only be successful and lasting when done by experts in repairs or re-roofing in Menlo Park, such as Shelton Roofing. Not only will this increase aesthetic or curb appeal; it will also ensure prime functionality and durability.